And here I go again for the familiar yet a bit different. This looks pretty but a skimp on the ingredients made it actually taste completely different. There was no shrimp, cucumber or cillantro and basil in it. It was technically a different flavored pancit, wrapped in lumpia wrapper and fried. But the concept was there, but maybe the execution was wrong. I soaked some vermicelli in hot water to soften them up. After about 10 minutes, I marinated them in a fish sauce, chili, sugar, and water concoction that is actually the dipping sauce for most of Viet spring rolls. I set this aside. The only other vegetables I had were carrots and sayote. So I sliced these into thin strips and cooked this with some salt and allowed it to cool. 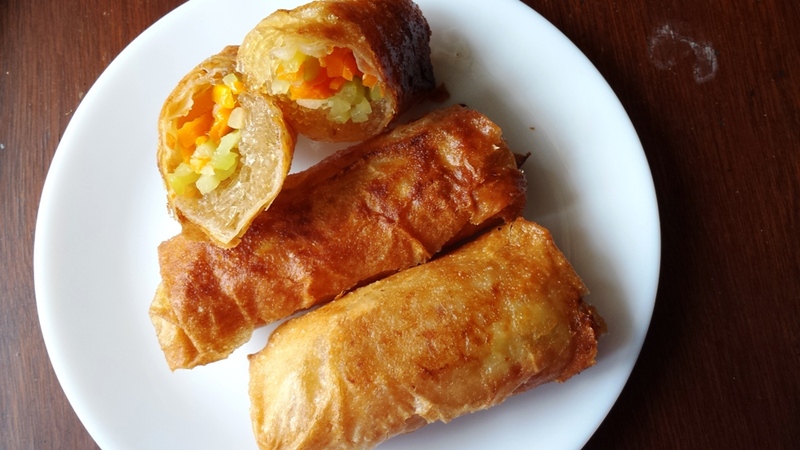 In a lumpia wrapper, I then layered some of the noodles, and both the vegetables and wrapped it tight. This was then fried and served with the sauce.